As you kicked off a new phase of your tour behind the bracing 2012 collaborative album Love This Giant on Wednesday at the lovely, Art Deco-era Wellmont Theatre in Montclair, N.J., a quibbling thought occurred. You’ve got that great band, built around an eight-piece brass section — make that brass section/dance troupe, with the amusingly effective and effectively amusing choreography you’ve given them. You all got to know each other and feel out the range of talents you collectively embrace on last year’s introductory tour. So why not, for an encore at least, let the brass really blast, really let loose for a version of, oh, Marvin Gaye’s “Ain’t That Peculiar?” The song’s snap-back beat would be a great extension of the rhythmic invention you displayed all night, the same way Clark’s effects-filtered guitar leads at times expanded on and contrasted the brass sounds. And a little evanescent duetting, Gaye and Tammi Terrell-style, between the two of you would make the perfect complement to the winningly arty manners of the concert. Something along those lines could even moreso tie together a set drawn mainly from the album, in addition to such St. Vincent solo gems as the colorfully defiant “Cheerleader” and, of course, several keystones from Byrne’s Talking Heads and solo catalog. Again, that’s just a quibble, just a little thought. There was nothing lacking from the show, per se. It’s a fully conceived, fully realized combination of two distinctive, idiosyncratic (in the best way) talents. The choreography, the players flowing around the stage or doing slo-mo dosey-does, was just part of it, as was the black-and-white color scheme (the silver front panel of Clark’s skirt and the now-platinum blond hue of her hair, not quite matching Byrne’s near-white cropped coif, the only slight exceptions). The artists’ differences were at times clearer than the similarities, physically manifest dramatically on one number in which they matched some dance moves. Byrne, sometimes strumming a Guild acoustic guitar, other times an electric and often without an instrument, was like the adolescent boy who dutifully, passionately learned all the latest steps for the spring school dance, his earnestness not hiding his clunkiness, but making it all the more endearing. Clark’s moves, though, were perfectly sharp and crisp, yet always leavened with a sense of joy. And so it was with the music as well. The opening “Who,” from their duo album, reflected Byrne’s sensibilities, with its staccato horn punches poking through his familiar vocal style, set the template for many of the songs, including versions of Talking Heads’ favorites “This Must Be the Place (Naïve Melody)” and “Burning Down the House” (one of the encores). Songs featuring Clark built on that with and often flowing, soaring sense of melody and structure in front of richly colored horn charts, justifying comparisons she’s earned to Kate Bush and Bjork. Two highlights stood out, making the fullest and most imaginative use of the resources at hand: For Talking Heads’ “Wild Wild Life” (which Byrne noted that none on stage, himself included, had ever performed in concert before this night), the brass players’ choreography brought each musician to the center-stage microphone for half a line in a tag-team hokey pokey of vocals. The smiles on their faces told the story in full. Then kicking off the second encore, Clark turned her St. Vincent selection “The Party” into somber-yet-beautiful poetry, musical and visual, the emphasis on the warm tones of French horn and trombone bathing the scene through slow foxtrot verses and waltz-time choruses. Through it all, though, a secret ingredient of the partnership bubbled up: a shared love of classic pop. Or not-so-secret, given its explicit role in the Talking Heads’ catalog. Here as in that older band, it made for a fine balance of visceral and cerebral, of warm emotions and cool art. So, David and Annie, don’t tell us you wouldn’t have a hoot doing some Motown or something of the ilk. And don’t tell us you haven’t tried out something like that in rehearsals. There was a little taste, even. At the end of the final encore, Talking Heads’ bouncy “Road to Nowhere,” you had the band do a coda with a real street-funk feel, a New Orleans second-line vibe as the musicians skipped off stage, a perfect echo of the Jazz Age theater’s setting. It was a different tone than had appeared through the show. And a little more of that, for this unique grouping, could be a golden road to somewhere. 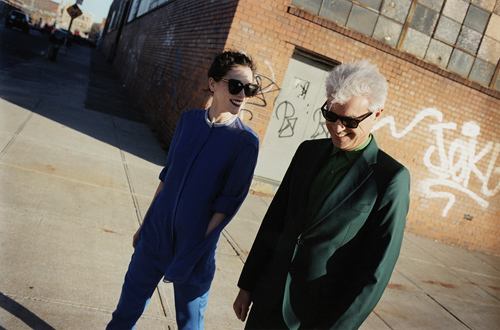 For more information, visit David Byrne and St. Vincent’s official website.